Back when it was clear that Jose Bautista and the Blue Jays were far apart on a potential contract extension, a number of fans sided with their slugger and against ownership, which despite being among the richest in pro sports has a reputation for failing to spend like it. The ire of one of those fans was directed at the statue of Ted Rogers, deceased former head of Rogers Communications, which stands outside the stadium. So Rogers called the cops. Kharshoum, who was dressed in sweatpants and watching an English soccer match in the basement, said he was surprised to see police officers at his door. When they told him they were there because of his tweet threatening the Rogers Centre statue, Kharshoum said he immediately rolled his eyes. “I can see how it was taken legitimately, but I definitely don’t think it should have been,” he told CBC News. Rogers Centre security alerted Toronto police, whose cyber crimes unit identified Kharshoum (it’s not clear if Twitter helped out with the identification). A judicious use of tax dollars. There’s another angry tweeter who was questioned by police, though his tweet promised to “burn every Rogers vehicle I see.” But it’s Kharshoum getting the attention because his “threat” was unrealistic and aimed at a statue that’s already pretty controversial among Jays fans. 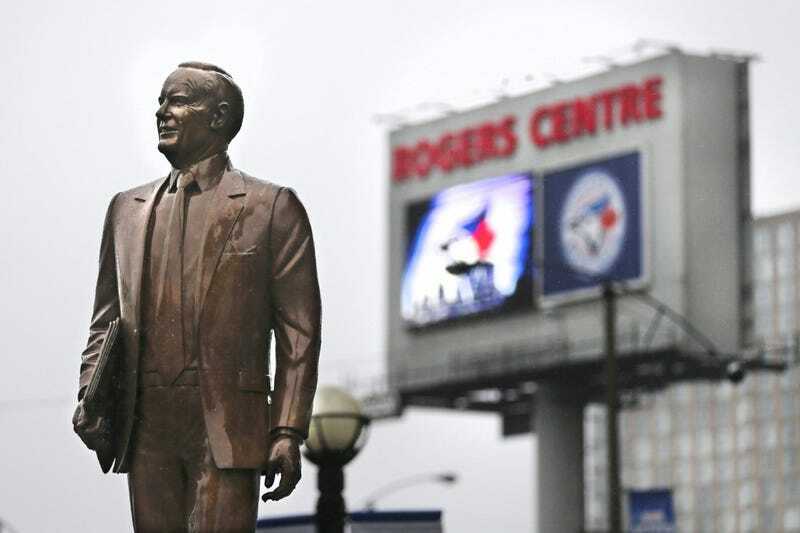 The Blue Jays don’t portray any of their former players with statues outside the Rogers Centre, and say they don’t currently plan to, so Ted Rogers stands alone, honored for nothing but his business acumen. So yes, a lot of Jays fans would love to see the Ted Rogers statue go into the harbor. But this isn’t Baghdad 2003; it’s not actually going to happen. Use some common sense. Don’t call the cops on fans who are obviously joking, but also don’t give a 35-year-old slugger $150 million.